Is The Seed Rally A Dead Cat Bounce? tl;dr Looks like seed-stage investment is going strong. Dun dun dun! I’m surprised. It turns out that the number of seed stage rounds executed in 2015 went up compared to preceding year, not down as I had expected. 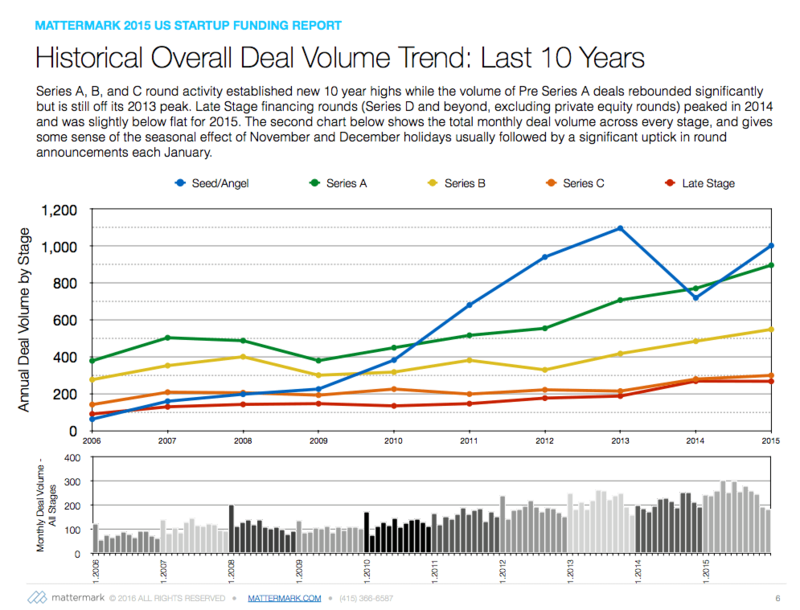 In early 2015, Mattermark reported that seed stage deal volume fell sharply in 2014. Declines in total dollars invested into seed-stage companies were more modest. After an incredibly impressive run up and to the right, things finally looked like they were cooling off. Dramatic, frankly. Given that decline and 2015’s relatively rough last innings, my gut instinct was that things had either stayed just flat, or declined modestly. Neither result would be catastrophic, but it would imply that a shift in investing patterns had occurred, and that 2014’s results were not a one-time blip. To summarize the above chart: Things go up for several years, then they fall. Then, surprisingly, they recover. 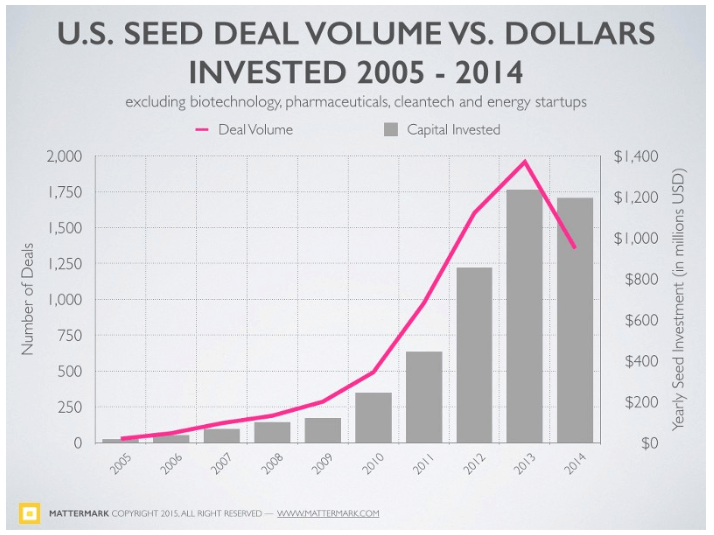 This begs the question: Are we seeing a dead cat bounce in seed-stage funding deal volume? What is a dead cat bounce? It’s a short-term market movement up after a sharp correction down. However, the dead cat bounce doesn’t make up all the preceding carnage. It can be comforting for investors to see an asset class return to its previously bulletproof ascent, but you won’t believe what happens next! Next the rally fades and a more declines are suffered. Hence, dead cat bounce. The thing managed to get a few inches off the ground, but it was never going to walk again. I understand that this analogy may seem a bit cruel towards animals, but I can assure you that no animals were harmed in the making of this blog post. You get the idea. Also notable is the ensuing ice age. After the failed rally and the following continued drops, it took quite a long time to recover prior heights. Seed was never hurting. Good entrepreneurs were more likely just busy[.] Good entrepreneurs get funded. Period. To get more concrete answers about 2016’s pace, I intend to pull full first-quarter seed-stage data when the quarter in fact ends, and compare it to the rates posted in 2013, 2014, and 2015. That should give us a better feel for what we’re seeing out in the market. In the meantime, strongly opinionated tweets based on small amounts of data are more than welcome. Featured Image via Flickr user Rebecca Siegel under CC BY 2.0. Image has been cropped.